Honig & Barnes, LLP has over 60 years of combined legal experience. 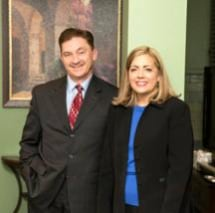 The law firm was formed by attorneys Robyn Frye Honig and Timothy H. Barnes. Robyn Frye Honig, Esquire graduated from Boston College in 1982 and Emory University School of Law in 1985. Attorney Honig is a member of the Massachusetts, New Hampshire and United States Federal Courts and has been practicing law since 1985. Attorney Honig has set precedent cases in the areas of family law, personal injury and federal jurisdiction. In November, 1993, Attorney Honig was featured on the front page of Massachusetts Lawyers Weekly for setting a precedent in personal injury law. Attorney Honig was selected by the State of New Hampshire as a Certified Guardian Ad Litem to investigate and make recommendations to the Court on issues relating to child custody and visitation. Attorney Honig is a member of the Board of Directors of the Hale Foundation, Haverhill Chamber of Commerce and many legal organizations. She is a past Secretary/Treasurer of the Haverhill Bar Association. Timothy H. Barnes, Esquire graduated from SUNY Cortland in 1983 and New England School of Law in 1986. Attorney Barnes is a member of Massachusetts, New York and United States Federal Courts. Attorney Barnes is an experienced civil trial attorney. Attorney Barnes is experienced in the areas of Estate & Medicaid Planning. Attorney Barnes has been a featured speaker in numerous legal seminars on Estate & Medicaid planning. Since 1990, Attorney Barnes has been teaching Business Law at Northern Essex Community College. Attorney Barnes is on the Board of Directors of the Haverhill Credit Union. Attorney Barnes is a founder and member of the Board of Directors of Christmas In April - Haverhill, Inc. and past President of the Boston Baptist Social Union.